Our strip steel is rolled through the cold rolling set and sent into the hot galvanizede set and annealed in the annealing furnace, then put it into the molten zinc pot to hot dip galvanize. After passivating(or finishing), stretching, straightening and the relevant processing on it, we can get the finished hot dip galvanized steel. Flat products with thicknesses of 0.13 mm to 1.00 mm made of steel for cold deformation with high conditional yield strength and continuous hot zinc coating. The thickness is the final thickness of the product after the coating. Available in sheets, coils and cut from coils products – longitudinal slitting (strips) and cut to length with dimensions according to client requests. Our strip steel is rolled through the cold rolling set and sent into the hot galvanizede set and annealed in the annealing furnace, then put it into the molten zinc pot to hot dip galvanize. 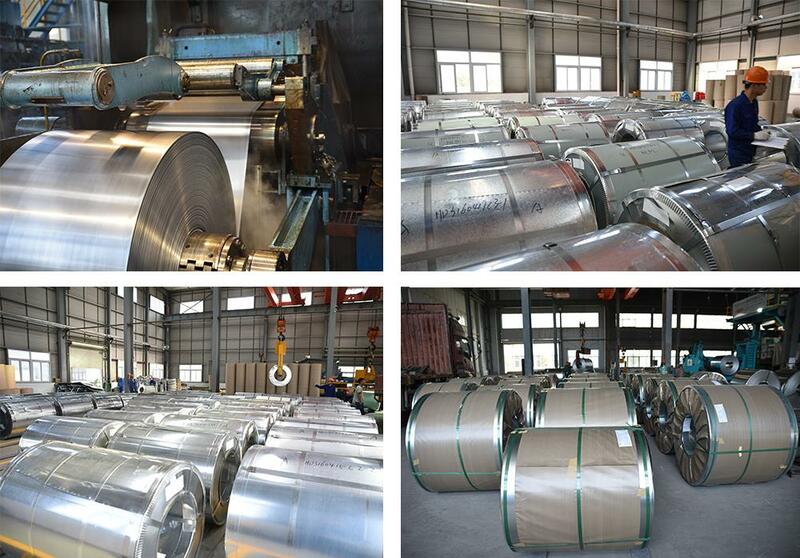 After passivating(or finishing), stretching, straightening and the relevant processing on it, we can get the finished hot dip Galvanized Steel Coils. The production of our company’s galvanized steel coils used in home appliances, computer chassis, electrical cabinet, vending machines, auto parts and color coated substrate. 5% aluminum zinc plated steel plate for Z,C type steel, air duct, window frames,automotive interior parts,color coated substrates,etc.. 55% aluminum zinc plated steel plate used in the wind pipe, automotive components, electrical equipment, refrigerators, ovens, color coated substrates, display cabinets, light weight steel,etc. 2. Less maintenance/Lowest long term cost. Even in cases where the initial cost of galvanizing is higher than alternative coatings, galvanizing is almost invariably cheapest in the long term (because it lasts longer and needs less maintenance). And, maintenance causes problems and adds to costs when structures are located in remote areas, and when plant shutdown or disruption to production is involved. 3. Long life. The life expectancy of galvanized coatings on typical structural members is far in excess of 50 years in most rural environments, and 20 to 25 years plus, even in severe urban and coastal exposure. 4. Toughest coating. A galvanized coating has a unique metallurgical structure which gives outstanding resistance to mechanical damage in transport, erection and service. 1. Based on our own experienced skillful workers and powerful advance facilities, we can accept both large quantity order and the fast delivery. Meanwhile,small order and customized order is accepted too. 4. Wonderful Financing support, Flexible payment terms. Q1:Are you manufacturer or trader? A: Yes,we are manufacturer,and if you need other special product,we will do our best to help you,so that we can build a long-term bussiness relationship. Q2: What's the brand name of your products ? A: Generally, we use our own brand "HUADA" and we have more than 19 years experience. Q3: Is the sample free ? Q4: How about the delivery? A: By containers on ship. Safe and cost effective way of delivery. Q5: What 's the MOQ? A: The MOQ is 50tons. Q6: What Standard your products follows, and what product Certificate you have. A: Our products are manufactured strictly according to national and international standard as customer’s request, such as ASTM, EN, DIN, JIS, etc. and we take a test on every coil before delivered out. We have CE, SGS, ISO. BV, certificate etc. Q7: How to guarantee the quality of the products? A: We have established the international advanced quality management system，every link from raw material to final product we have strict quality test；We resolutely put an end to unqualified products flowing into the market. At the same time, we will provide necessary follow-up service assurance. Q8: How long is the warranty? A: The whole machine of our products have 24 months warranty,and we sure the product will be free from maintenance whithin warranty period.Low charge for continue maintenance when warranty is expired. Q9: Can I order the product with special size? A: Of course you can,and meanwhile according to your detail requests. Q10: How long can we receive the product after purchase? A: Usually within thirty working days after receiving buyer’s advance payment or LC. We will arrange the factory manufacturing as soon as possible. The cargo readiness usually takes 15-30 days, but the shipment will depend on the vessel situation.